A recreation of the story “Sadako and the Thousand Paper Cranes” by Eleanor Coerr. Based on a true story, Sadako Sasaki was a girl living in Hiroshima at the time of the atomic bombing by the United States on August 6, 1945. Ten years later, Sadako was diagnosed with leukaemia from the radiation and was told she had, at most, a year to live. Inspired by the Japanese legend that one who created a thousand origami paper cranes would be granted a wish, she set out to achieve this. Her wish was simply to live. However, she only reached 644 before dying in October, 1955. 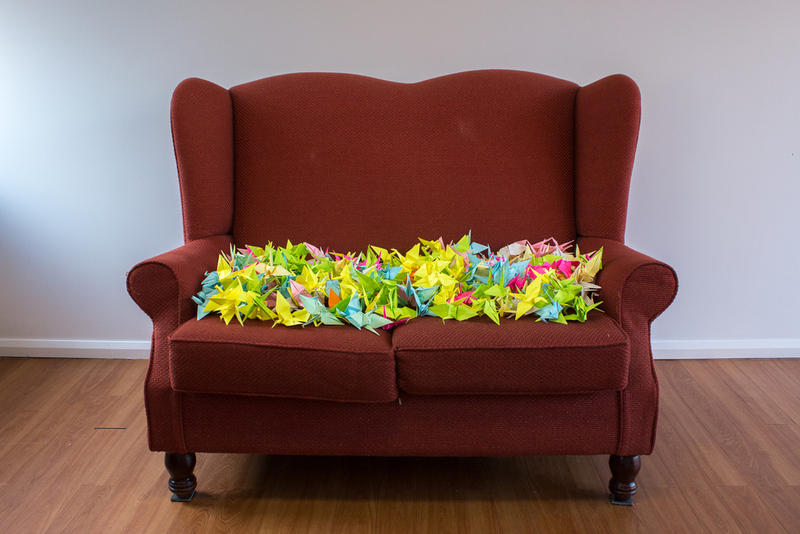 Her friends and family folded the remaining cranes to help her reach 1,000. Models: Hillary McArthur, Tracy Beattie and Hero Cook.